Before leaving San Ignacio, Beth and I spent one night with hook-ups and free wifi to catch up with our blogs. This RV park is just utside of San Ignacio. From there we headed back over the mountains to Catavina. We stopped to take a few pictures of the boulder fields. There was a sign that said there was a museum and cave paintings here. I think the museum is closed. But there are still marked trails. We're back in the land of the Boojum Trees. Bloom on the top of a Boojum Tree. Close-up of the trunk. The tiny branches have thorns. Parked beside the Boojum Trees. We found the area that leads to the ancient rock art. This sign says we must have a guide to see them. We weren't planning to drive back to Catavina to locate and schedule a tour. So we followed the paths a ways to read the signs. They were all in Spanish, but I could understand enough to tell they described the origins of the native people (los cochimes). Almost all that is known is what was recorded by the Spanish missionaries that encountered them, and what can be learned from the rock art they left. It is believed that the girst inhabitants migrated on foot from the north. An unusual cactus that has grown back on itself. This descibes how the natives made bows and arrows. We didn't climb up to see this one....I decided we had gone far enough without a guide....don't want to get in trouble. 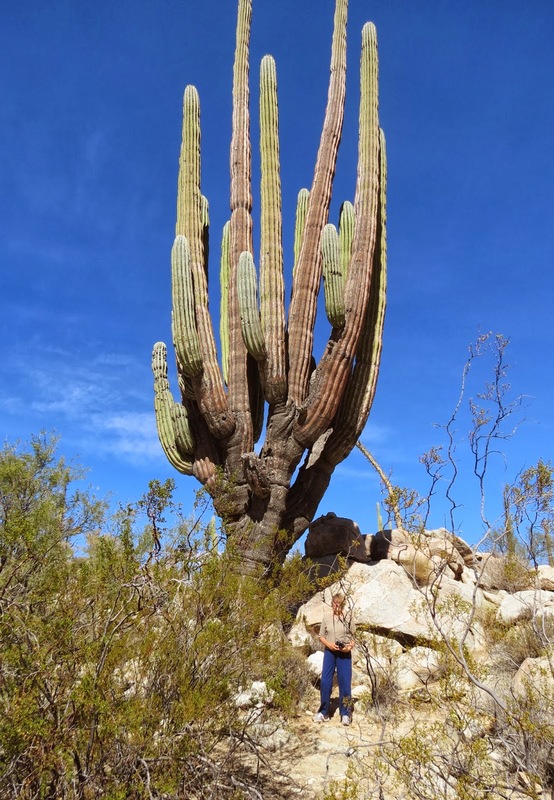 Beth standing beside a giant cactus. We stopped at another location to walk among the giant boulders. And we stayed overnight in a gift shop parking lot west of Catavina. The sunset was pretty, but it was windy and dusty. Today we made some stops to take pictures of the Agaves in bloom. Do you see the bird? Over the mountains we go. Entering El Rosario...a green fertile valley where much agriculture takes place. Stopping for gas at a Pemex in El Rosario. The clouds in the distance are over the Pacific. Note the horses grazing by the highway. And so we are back on the Pacific side of Baja....a little north of San Quintin. 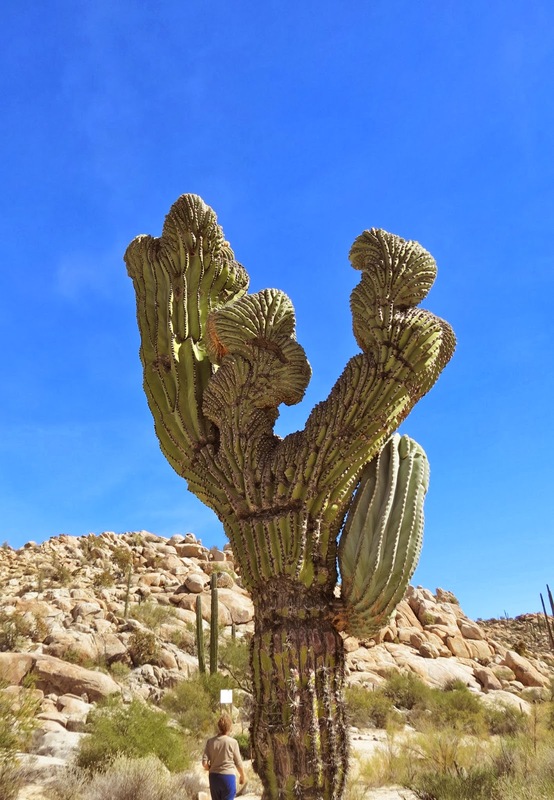 The Boojum trees are very unique. Some interesting desert scenery here.